SKU: BD49337. Category: Travel. Tags: journal, memories, road trip, travel, traveling. On those days when the magic hits you hard and the joy of an experience sends your heart spinning—that memory must be captured. 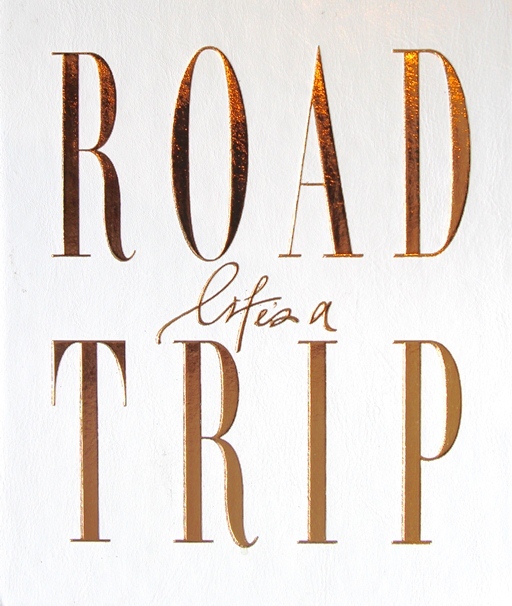 Life’s a Road Trip is the latest installment in the Insert your story series following Swept Away by Wanderlust and My Bucketlist. This fun journal is here to inspire you to plan and kick start the road trip of your dreams. You don’t just open the book and find empty pages. You will find pages filled with travel prompts, inspiring quotes and stories from professional nomads. This journal is made for you to scribble down your favorite sing-a-longs, stick in your own postcard and worthy photos. It also offers you a place to keep your festival passes covered in mud. Don’t stick your road trip memorabilia away in a closet, put it in your journal. Build and record every second of your road trip adventures with a traceable world map, thought provoking questions and planning pages for all the places you will go and the places you have yet to get to. Clad in white vegan (faux) leather highlighted with rose foil stamped cover the journal’s interior is just as luxurious featuring the same high quality paper and binding employed in all Axel & Ash journals. Axel & Ash is a design & publishing house from Bondi Beach, Australia creating stylish journals full of happiness and inspiration for you to Insert YOUR story. Their best-selling books have pride of place in trendy concept, fashion and book stores all around North America, Australia & Europe. HANNA AXELSSON SAHLEN (Axel) is a creative soul from Sweden with a mind full of ideas. Usually seen with a camera around her neck she loves photography, design, film, road trips, great stories, yoga, raw food cakes and the surf. Hanna graduated with a degree in business & marketing as well as a diploma in Film & TV. She spent years working as a TV director for ABC News, before branching out into production freelancing as a cinematographer and editor, creating beautiful stories about all walks of life. ASHLEIGH POWELL (Ash) is a dreamer, adventurer and always curious. She loves fresh coconuts, fashion, art, photography, music and adores anything vintage. Her biggest passion is writing and travelling this big beautiful world. Ashleigh graduated and specialized in financial planning & business management, where she worked in the industry for over eight years. She has also completed numerous writing courses and is now following her passion. Along with designing inspirational books for Axel & Ash, Ashleigh is currently completing on her first novel ‘Katana’. With details concerning major attractions, off-the-beaten-track spots, drinking and nightlife venues, and restaurants and hotels/hostels from all over the city, Panda Guides Beijing is the most complete guide of its kind. Written by a team of expats who live in and know China’s roaring capital, our Beijing title is the first guidebook to offer local discounts to readers, as well as an opportunity to win a free trip through China by purchasing the book.